Business cards aren’t just a nice-to-have. They are a must-have and serve a very important purpose. Used as part of your identity and to essentially expose and promote your brand, your business card should reflect who you are and most importantly, how to get in touch. Ensure your business card stands out. Get in touch with Phuse today for unique and professional business card design. Trust Links are a mental health and wellbeing charity based in Southend, Essex. 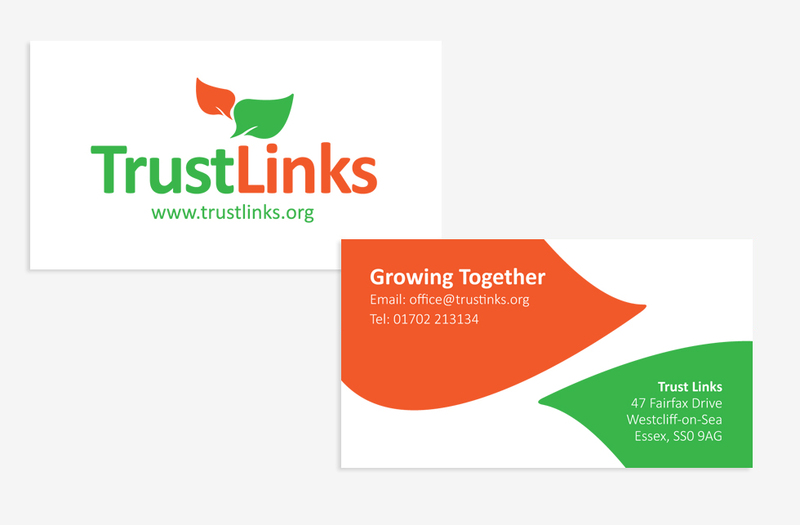 Phuse worked closely with Trust Links to develop a new brand logo, we then moved on to develop a new website and printed promotional material including business cards, leaflets and stationery. "Trust Links are delighted to have worked with Phuse Media on the redesign of our logo, website and print. Matt Gates worked hard to capture our ethos in the palette, look and feel of our brand across all formats. We have had a great and very positive response to our new look and would not hesitate to recommend Phuse. "